How do you Compare to the Top 400 AFL Fantasy Coaches? What does a vanilla team look like from the top 400 coaches? Magtuto looks over the numbers. It’s week seven of the AFL Fantasy 2017 season and most of us are ‘happy’ with our team selection. Given what we know now, I’m sure a lot of you, including myself would make one or two (maybe four) changes to our Fantasy squad. However, it is what it is and I hope this write up will guide you in your strategy moving forward. I was ranked just outside the top 400 last week (Team Ricontop – 426), so I started looking at the data and the make-up of the teams in front of me. In week 6 the top 400 team vanilla side consists of the players below. Last week my team had 15/22 vanilla selection as per listed above. At the start of the season, I made a choice of not starting with both Patrick Dangerfield and Tom Rockliff. Every week I cringe at Rocky’s scores wishing he was in my team and although Dangerfield had a low score last round, he can easily pump a 150. Like most on the AFL Fantasy selection table each week, the big question is, do we go vanilla or unique? Last week, I had a choice of selecting Dangerfield/Rockliff or bring in a unique like Zach Merrett who was in just 7.5% or 30/400 teams. I knew that Warnie was keen on Merrett and when Calvin named him as number 1 captain choice, I welcomed Merrett onto my team and slapped a ‘C’ on him! Last week, I was ‘kissed on’ and progressed my ranking to from 426th to 54th overall. These six players represent the most common defenders in the top 400. It is no surprise that Taylor Adams is in 96% of the teams, he has been both consistent and one of the most durable defender this year. After Adams, most teams in the top 400 will have Andy Otten, Caleb Marchbank, Curtly Hampton and Rory Laird. It will be interesting to see the make-up of the top 6 defenders as we upgrade from rooks to guns progressing through this season. The ‘Doc’ scored 159 last week, although Sam Docherty’s top 400 ownership is far from unique (54%), I am still surprised that he is not in more teams in the top 400. If that was a crime, I present to you Kade Simpson, take a bow, with 161 points last week. His top 400 ownership is only 4%. Another unique pick is Dylan Roberton, is he the real deal? A question for The Traders. Who do you think will be in the top 8 midfielders by the end of the year? I am sure this is one of the questions that “The Traders” will cover soon on their podcasts so make sure you follow them. 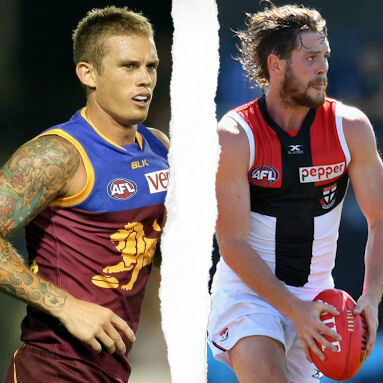 The most selected Midfielder in the top 400 is no other than Dayne Beams. He had a less than average game last week and there will be 382 coaches in the top 400 who will be forced to trade him out this week. If you choose vanilla, my picks are still either Tom Rockliff or Patrick Dangerfield. Out of the two, my pick is still Rockliff, this week comes against Sydney (oink oink). As for unique, I present to you Gary Ablett (GOAT), it is a crime that his percentage ownership is so low both overall and in the top 400. AFL Fantasy team ‘SOAG’ is currently the number 1 ranking team. Last week he was ranked 26. Guess which unique player he had which leapfrogged him from 26 to number 1 (Hint first name Gary). If you want super unique then what about Jack Steven? A sideways trade from Beams to Steven will cost only $2K. Steven is owned by only 1 team in the top 400! Toby Nankervis is owned by 50% of all AFL Fantasy coaches and about 91% of the top 400 coaches. Out of the 364 top 400 coaches, 67% (267/400) play him as 2nd Ruck. If Braydon Preuss ($316K, Ownership 53% Top 400 Ownership 82%) is named this week, the vanilla pick would be to play Preuss and either hold Nankervis or trade him via DPP and upgrade another line. If unique in your choice, Sam Jacobs is on only 1% of the top 400 teams! If you have been kicking with Alex Neal-Bullen and Dan Houston in your team, you would have been enjoying watching them every week as they both have produced more than acceptable scores. Last round, both had bad AFL Fantasy scores of 31 and 44 respectively and may be the reason for the ranking shuffle in the top 400. The Western Bulldog’s duo of Luke Dahlhaus and Jack Macrae are the two most selected premiums in the top 400. If you want unique, Nick Riewoldt (Yes I said unique) is currently owned by just 1.8% of the teams in the top 400. If you are fortunate enough this week to escape injuries and team selection issues, trade him in. If you are a bit short on cash Isaac Heeney is cheap and he is also unique. However, personally, I would like to see one or two more weeks from him before I pull that trigger. I will be compiling a list of the top 400 teams weekly and will aim to have something written up every 3 weeks. If there is anything specific you want answered, make sure you add me on Twitter @magtuto so I can answer your Q’s. Go unique! A full and raw list of players and their % representation can be found on the excel spreadsheet. Click here to download. Being desperate for a cap, I’ve been tracking myself against the 100th placed team, whoever that is each week, and doing similar analysis to try and find a unique player that’ll allow a rise in the rankings. Your work here will be invaluable….and makes me rethink my Steele trade this week. Rocky is a problem. He’s a must have if you want to stay in touch, but ownership at that level is so high……oh well, maybe next week. as a top 400 rep, its nice to know ive only got 11 of the vanillas. so i can afford to be safe and bring in another. Got 18 of the 22 and sitting 167th overall. Got Grundy instead of Martin tho. Is it worth upgrading Nank to Martin or go ANB to Sloane this week to chase points? I’m 18 as well, and also have Grundy over Stef. Would’ve loved to have got Nank up to Stef this week but Beams to Zerrett stops that in its tracks. Are you going Beams to Myers? Or got some cash sitting? I would prioritise Nank to Martin though. Probably gotta be done at some point, so now is an ideal time with the suspension IMO. I’ve got 15/22 and I’m 28937…where have I gone wrong? Mind you, I couldn’t trade for two weeks at the start of the season due to really terrible cruise ship internet, and 2 of those have only just come in. I’d say thats the problem..
Beams out Rocky in this week and will have to wait for tonight’s team to decide what i’m doing with nank. Getting the Captain right last round being Sloane and not Dangerfield was the reason i jumped from 410ish to 93. I’ve been ranked inside the top 60 for all but 1 round this season. I’m going after a hat so this will be great info. Is david myers playing this week? great article, just wondering who’s more unique out of sloane and merrett? At the bottom of the article: A full and raw list of players and their % representation can be found on the excel spreadsheet. Click here to download. In the spreadsheet it shows Merrett is in 77 vs. Sloane in 86. Interesting that last week Sloane was in only 8.5% of the top 400 teams. Was in the top 300 for a couple weeks, but dropped down to around 1000th on the back of Watson, ANB, Beams, Fyfe..
Taken a bit of a risk and gone with 2 PODs in Roberton & Duncan instead of the more popular choices..
There’s lies ,damn lies and statistics. RDT Rankings are nice but you’re not in the big league. MAYBE MIldura thirds. Would probably go SPP to Myers next week anyway.. Outstanding article Maguto. This will be really helpful in planning and deciding on those 50/50 calls. I feel we’ll be playing catch up though, so I like your call on some uniques to maybe get ahead. Great article. I Own 18/22, makes sense since I’m ranked around the 200 mark!